This Catalog is the product of an extended study of the compositions of Jan Bender, and reflects an extended friendship with the composer and his family. The biographical essay that begins this volume was previously printed in a Festschrift for Heinrich Fleischer (classmate of Bender's with Karl Straube in Leipzig in the early 1930's) titled Perspectives on Organ Playing and Musical Interpretation. It was published by the Heinrich Fleischer Festschrift Committee at Martin Luther College in New Ulm, MN in 2002, and is reproduced here with their kind permission. An earlier version of this essay appeared in Cross Accent (Journal of the Association of Lutheran Church Musicians) in July 1995. 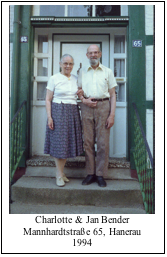 I received generous hospitality from Charlotte Bender (who passed away on March 2, 2002) during my several stays in Hanerau. She also shared many invaluable insights and memories during our long conversations. I am especially grateful to her and the whole family for having allowed me complete access to all of Jan's papers, journals, contracts, royalty reports, recital programs, etc. Friedemann Bender was of particular assistance explaining many details and sharing his memories. Matthias Bender provided constant support of my efforts to preserve his Father's musical legacy. 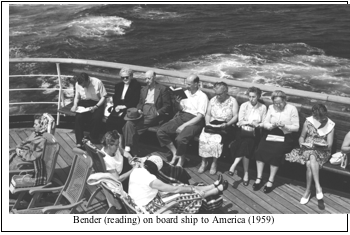 He also graciously allowed me to reproduce photographs from the Bender family collection and to include scans of several excerpts from Jan Bender's diaries. The newspaper photo (appearing with Opus 81 in the Catalog) is reproduced with permission from the Mankato Free Press. 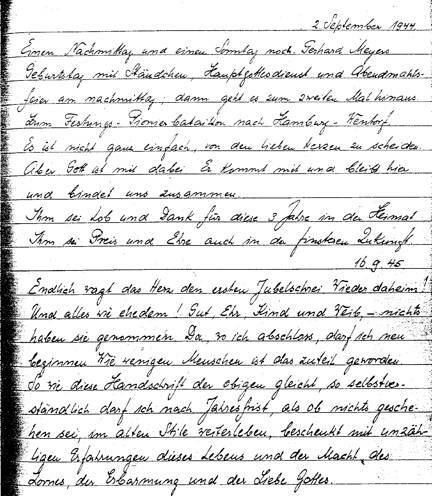 I took the color photos, made the scans of excerpts from Bender's diaries that appear in several places, and provided the translations. My gratitude also extends to Arndt Schnoor for his unstinting enthusiasm for the music of Jan Bender, for his efforts to honor Bender's legacy through producing exhibitions in L�beck and L�neburg, and especially for his eagerness to arrange for the preservation of Bender's Archives in the 630-year old Stadtbibliothek L�beck, where he is Head of the Music Department. These Archives now join those of Hugo Distler, Bruno Grusnick, Walter Kraft, Karl Lichtwark, and Erwin Zillinger. To my wife, Judy, I owe special thanks. In addition to putting up with my several trips to Hanerau, she also accompanied me twice, spent long hours transcribing information from documents and recital programs and conducted internet library searches for me after she returned home the last time. 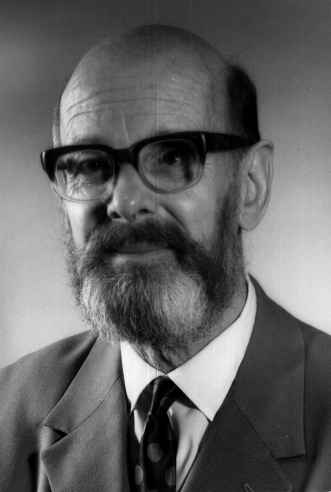 Jan Bender, church musician, composer, organist, and teacher, was a product of several currents which were significantly altering the face of the church and its music in Germany between and following the cataclysmic World Wars. The Orgelbewegung (organ reform movement) had been started by Albert Schweitzer's pamphlet The Art of Organ Building and Organ Playing in Germany and France, published in 1906. After World War I, the construction of an organ in 1921, based on a disposition and scalings from Michael Praetorius (1618), led to the Freiburg Conference of 1926, at which time the organ reform movement became closely allied with the liturgical and church music reforms being spearheaded by Christhard Mahrenholz. This organ reform movement had a distinct impact on the leading teacher and performer of the first half of the Twentieth Century, Karl Straube (1873-1950), who was to be Jan Bender's organ teacher in Leipzig. A new, more liturgical approach to church music grew from this movement, drawing into its sway, among others, Kurt Thomas, Johann Nepomuk David, and Ernst Pepping. These composers exerted a strong influence on Hugo Distler (1908-42), who became the real leader in choral composition for the church, as well as a new style of organ music. Distler forged a highly successful fusion of late Renaissance and early Baroque structure with a modern rhythmic freedom and expressiveness, elevating church music to the highest levels of craftsmanship while continuing to incorporate the chorale melodies of the church. The freely expressive centrality of the text in Distler's choral works is regularly evident also in the choral works of his only composition student, Jan Bender. Jan Bender was born on February 3, 1909, in Haarlem, Holland (exactly 100 years to the day after the birth of Felix Mendelssohn). His father, a piano dealer, had died of pneumonia the previous August. When he was 13 years old, his mother moved the family back to her native L�beck, to live with her Father, a prominent Marzipan baker, at K�nigstra�e 59 (his house and Marzipan Fabrik). This house, built in 1295, is just a block behind the Apse of the Marienkirche. While Jan had studied piano in Haarlem, he was drawn to the organ at the Marienkirche, and began studying with the organist, Karl Lichtwark. As a teenager he also began composing, coached by his music teacher at the Oberrealschule zum Dom in L�beck, Bernhard Cappel. In fact, he wrote a string quartet as his graduation project in 1928! This four-movement work is remarkable for its well-developed control of form, the sweep of its melodies, and hints of the humor and rhythmic complexities to come. His technical skill is particularly evident in the second movement, which he wrote in 5/4, using both regular and triplet eighth notes as well as sixteenths within these asymmetrical measures. 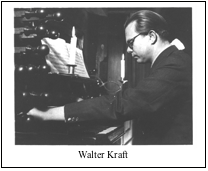 In 1929, he began studying with the new Marienkirche organist, Walter Kraft, though these lessons were interrupted twice by extended hospitalizations for spinal tuberculosis. It turned out that he didn't have this disease at all, just an extra rib! While this delayed him by a year from going on to school after completing his Abitur, he kept on composing and studying scores. F.: What was it that influenced you to become a church musician most of all? B.: When I came from Holland and went with my dear mother every Sunday to St. Mary's church, I was only thirteen or fourteen years old. I could not really quite understand what the pastor was talking about. In the first place, my German was not yet that good. I had learned a little bit from my mom, but otherwise, on the street and in school, we talked Dutch. Certainly this man there on the pulpit was very dignified, but what attracted me more was the organist there a hundred feet high. And this old man, the forerunner of Walter Kraft, kind of liked me. He was already old and couldn't see very well any more, so I was very welcome to him and to his daughter who always had to accompany him. When I was there, she didn't need always to come. I could listen so that when the pastor stopped (you couldn't hear a word up in the balcony there, but you could tell when he stopped preaching), then I had to tell the good organist to ring the bells for the bellows blowers. It was all done by foot in that time. There was no electric motor; that came later in the thirties. I liked his music, and he liked me. He asked, "Shall I give you organ lessons?" "Yes, why not?" I thought. It was romantic there in that big cathedral. I was permitted to study on that little choir organ. I had piano class and organ class. Because I liked the organ so much, I felt at home in the church, notwithstanding the German I couldn't understand. Well, this big cathedral, that influences a little fellow! At least at that time we were still susceptible for such a thing. Nowadays my boys run in and out as if it were a fair or a market. The impression is not that dignified any more. But such a big room impressed me immensely, and that probably made me a church musician. Then I heard of Straube and Ramin in Leipzig, and I thought that Leipzig must be a great place to go to study church music. Then the Nazis came, and Straube said, "Bender, you are still a Dutchman." I had been living already a couple of years in Germany, but he said, "You will never get a position here. You are Dutch, and you better go home." Years later I wondered why he did not try to encourage me to become German. Why not? Because he couldn't! He couldn't on account of his conscience. Nobody could become a German [at a time] when Germany [was] becoming Nazi. He [had] already looked through that whole thing, and so he could understand that. He was a very great man. Jan took his advice and went to Amsterdam, but was disillusioned with the musical possibilities in the Dutch Church and decided to return to Germany. In 1934, back home in L�beck, he was appointed Organist at St. Gertrudkirche in June and became a German citizen in July. That fall he enrolled for further study at the new L�beck Staatskonservatorium where he became an organ and composition student of Hugo Distler. 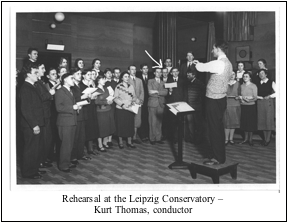 In September 1935, he completed his exams as an organist and choral conductor. 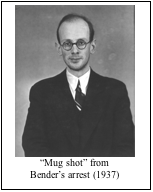 He continued studying with Hugo Distler until December 1936. Der Unterricht in Leipzig bei Karl Straube, C. A. Martienssen und Kurt Thomas hatte mich gelehrt, wie ich arbeiten mu�te. Der Unterricht bei Bruno Grusnick und Hugo Distler lehrte mich, was ich arbeiten mu�te. From his earliest comments in his journals, it is clear that as a composer, Bender was concerned with how to write "modern music", though he wasn't anxious to shock his listeners. Bender came to regard his own music as a bridge between the past and the modern music of the present and future, particularly in the church. In interviews with David Herman, quoted in his book (page 64), Bender said: "The gap between very advanced music and the Christian layman becomes so far that it cannot be understood anymore, therefore, I dared to consider my work as a bridge between them." Finally, in October 1937, Bender was hired as Organist and Choirmaster at St. Lambertikirche in Aurich (East Friesland), where he remained until 1952. He married Charlotte Peters at her father's church in Heiligenstedten, Holstein, on June 21, 1939. They met for the first time at a Singwoche in Detmold in March 1938, but she had heard of him before. She was a student at a Bible school in Dortmund. While there, she had been attending secret meetings of a group that was praying for members of the Bekenntniskirche who were in prison. Jan Bender, organist from L�beck, was the only North German on that list and, since she was also from Holstein, she paid special attention. Her enduring interest and concern for him led to their meeting at the banquet at the end of the Singwoche. They began corresponding, became engaged, married, and spent 55 years together. 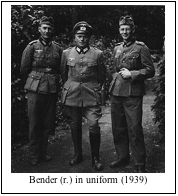 Jan Bender began his military service with three months of training in the spring of 1939. He was married on June 21, and then in August, he was called to active duty, serving first in France (near Aachen), then Denmark, and finally in Russia. In August 1941, he was wounded at Luga, near Leningrad. Shrapnel from a Russian hand-grenade severed his left optic nerve. After recuperation, he was sent home to Aurich and, though still in the Reserves, was able to resume his duties at Lambertikirche and as Kirchenmusikdirektor for Ostfriesland. This last post required him to supervise all the parishes in his district, visiting each one every year, advising the church musicians on their work, recommending additional study in some cases, organizing workshops, etc. He was responsible for this to the Superintendent of the Landeskirche von Hannover, who was none other than the renowned Christhard Mahrenholz mentioned above, editor of Musik und Kirche. Der Krieg... der entsetzliche Krieg.. ist f�r mich zu Ende. Gott hat ein Einsehen gehabt. Am 17. August, in der ersten Morgenstunde riss mir vor Luga ein russischer Handgranatsplitter das linke Auge fort. Jetzt bin ich "daheim." � Mittagsruhe im ganzen Hause. Es ist nicht ganz einfach, von den lieben Herzen zu scheiden. Aber Gott ist mit dabei. Er kommt mit und bleibt hier und bindet uns zusammen. Ihm sei Lob und Dank f�r diese 3 Jahre in der Heimat. Ihm sei Preis und Ehre auch in der finsteren Zukunft. Endlich wagt das Herz den ersten Jubelschrei. Wieder daheim! Und alles wie ehedem! Gut, Ehr, Kind und Weib, - nichts haben sie genommen. Da, wo ich abschloss, darf ich neu beginnen. Wie wenigen Menschen ist das zuteil geworden. Ich m�chte m�glichst schnell heim, das Auricher Singb�chlein abschreiben in Druck geben, ein ber�hmter Mann werden und gar eine Sing- und Konzertreise durch die Vereinigten Staaten machen. Aber in diesem elenden Lager muss ich wohl noch lernen, dasz Gott seinen Kindern oft ganz andere Wege f�hrt, wie sie zu gehen beabsichtigen. It is noteworthy that all of his desires were met, probably even in part surpassed! In addition to Hugo Distler, a second important influence on Bender as a composer is the work of Paul Hindemith. While he never had the chance to study personally with Hindemith, he thoroughly studied the music and treatises by Hindemith, even calling him "Saint Paul" out of affection and respect. From Hindemith came some of Bender's ideas regarding harmony (especially quartal harmonies), use of non-harmonic tones, and analysis. This influence is especially evident in his textbook on organ improvisation (opus 59) and in his Experimentum organo (opus 55). 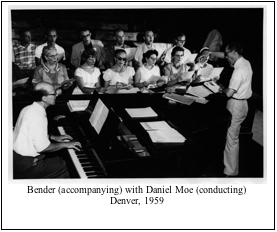 Bender also required his composition students to study and use Hindemith's Craft of Musical Composition. Bender remained in Aurich until 1952. Then, for a year, he went to Jacobikirche in Langen, near Frankfurt am Main, but moved on in 1953 to Michaeliskirche in L�neburg. This is the church where Johann Sebastian Bach had studied as a teenager. Bender established good collegial relationships with the musicians at the other two main churches in L�neburg, sponsoring joint concerts and cooperating for major festivals. According to reviews of the time, this was a welcome change from the previous prevalent competition. During these years (1953-60), in addition to his responsibilities for oversight of all church music activities and facilities in the region (he was named Kirchenmusikdirektor for the Diocese of L�neburg in 1955), Bender's work began to be known in America. A few of his motets were enclosed in an issue of Musik und Kirche and thereby came to the attention of some Lutheran church musicians in the United States. On March 2, 1954, he received a commission from Pastor Fred Otto of Fremont, Nebraska (later the founder of Chantry Music Press) to write a St. Mark Passion (opus 11 no. 1). That same day he received in the mail an invitation from Ed Klammer, music editor at Concordia Publishing House, to become a "house composer." Two of his chorale preludes had already been included in the Parish Organist, edited by his classmate from Leipzig days, Heinrich Fleischer, who was then at Valparaiso University. His next publications with Concordia were several Gospel Motets (Opus 12). 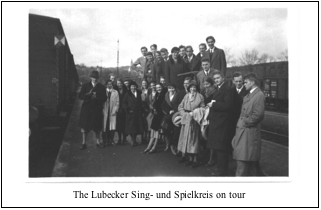 As a result of this exposure, and contacts made during the Bachfest in L�neburg in 1956, Bender was invited as a visiting professor, first to Valparaiso in the late spring of 1956 to replace Heinrich Fleischer for a couple of months, and then by Daniel Moe to teach a summer session at the University of Denver in 1959. Upon his return to L�neburg, he discovered that his substitute had not adequately discharged the duties at the organ during Bender's absence, and the new Pastor declared that Bender would not be allowed to leave for such an extended period again. In his Christmas letter to Prof. Hoelty-Nickel at Valparaiso, Bender asked him to look for possible positions in America. On January 18, 1960, he received an invitation to teach at Concordia Teacher's College in Seward, Nebraska, and in April the official call arrived. With much thought, and considerable disagreement from many of his relatives, he accepted the invitation and moved to the United States in September. For that first year, his third son, Friedemann, came with him, while the rest of the family stayed in L�neburg (the oldest son had only one year left before his Abitur). The next fall, his wife, Charlotte, and sons Jan Eilhard (having just completed his Abitur) and youngest son Matthias joined him in Seward. Christoph remained another year in L�neburg to finish his Abitur before immigrating. 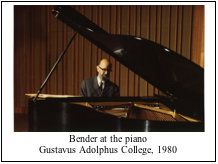 In addition to his heavy teaching load of organ and music theory at Seward, Bender launched an active recital career, including fourteen concert tours throughout the continental United States, Alaska and Hawaii, as well as in Canada, Germany, Holland, Norway, and Spain. His hand-written list of concerts played or conducted throughout his career includes 312 recitals and Abendmusiken, but this author has found a few additional programs to add to the list! While Bender was not a flashy performer, his playing was always very musical, with a strong sense of line and shape. His repertoire included the Baroque German masters, Mendelssohn, Reger, Micheelsen, Pepping, the two Distler Partitas (which he had studied with the composer), a few other contemporary Germans, and his own compositions. Only very rarely did he play a concert of only his own pieces. One of his most amazing recital series was presented during summer, 1947, in Aurich, where he played fourteen weekly organ recitals organized into a veritable survey of (German and Dutch) organ repertoire and styles. His oral program notes were always informative and entertaining. In 1965, Jan Bender received an invitation to become Associate Professor of Composition and Organ at Wittenberg University in Springfield, Ohio. This was appealing to him partly because of his desire to spend more of his time teaching composition. Wittenberg also had, in those days, a very strong church music program with ties to the Kirchenmusikschule in Berlin-Spandau (now closed). So, in the fall of 1965, the Benders moved to Wittenberg, where he worked until retirement in 1975. Maintaining his ties with Germany, he exchanged positions for spring semester, 1971, with Heinz Werner Zimmermann in Berlin. For seven summers (1966-72) he also taught at the Schola Cantorum at Concordia Seminary, St. Louis, Missouri. He spent most of his sabbatical leave, fall semester, 1972, in Jerusalem (where his older sister had settled), composing and performing. This was his second trip to the Holy Land—he had visited there after his term of teaching in Berlin the previous year. Throughout these years in the United States he continued to be very productive as a composer of organ and choral works (opus numbers 20-64). He was promoted to Professor in May 1974. Though he retired in 1975, he was asked to stay on another year as Professor Emeritus, teaching part-time. One activity that was quite important to Dr. Bender was his involvement with hymnody. A great percentage of his compositions use chorale tunes (and texts), both in cantatas and choral settings as well as in chorale preludes and accompaniments for organ. He even used chorale tunes in a set of piano pieces written for Abingdon Press (opus 31 no. 2), although the piece titles only refer to the appropriate season of the church year. Beyond this, Bender was very active in promoting the thorough and appropriate use of the new Evangelisches Kirchengesangbuch (EKG), which was introduced throughout the church in Germany in 1950. He organized workshops for the church musicians in his region to study this new resource and started a collection of chorale preludes and intonations intended to supply material for every tune in this hymnal. This manuscript resource (opus 75a), in three volumes, was never completed, though this author believes, based on calligraphic and ink evidence, that he started it shortly after moving to L�neburg in 1953 (possibly in conjunction with opus 9 no. 16), returned to it in the mid 1970's, and again in the early 1980's (before beginning opus 75b). For this collection, like with Bach's Orgelb�chlein, Bender first wrote the titles of all the chorale tunes in EKG, one per page (sometimes allowing two pages per title), and then entered some pieces. Instead of following the hymnal order, however, Bender entered his titles in alphabetical order by tune. There are 264 titles listed, of which he entered 119 settings for 74 of the tunes. His earliest compositions were also chorale-based and of wide scope, opus 1 containing 122 chorale settings for SA or SAB choir, while opus 2 included 90 short chorale preludes (many designed for a one-armed organist, i.e. using one hand and pedals). These pieces, still in print today, are a wonderful study in developing short chorale introductions. The first ones were written specifically for his friend and Leipzig classmate, Hans Pflugbeil, who lost his right arm at the very end of the War, but continued his career as a prominent church musician in Greifswald! After moving to the United States, Bender became involved with the preparation of a new hymnal for the Missouri Synod. In 1962, he was appointed to the Subcommittee on Music of the Missouri Synod's Commission on Worship, Liturgics, and Hymnology. The Commission was preparing to develop a new hymnal to replace The Lutheran Hymnal, which had been published in 1941. Their work culminated in the publication of Worship Supplement in July 1969. In the meantime, the Inter-Lutheran Commission on Worship (ILCW) was formed to prepare a new hymnal for all Lutherans in North America. When Bender moved to Wittenberg University (a college of the Lutheran Church in America) he was allowed to continue as a member of the Missouri Synod hymnal committee since he joined a Missouri Synod parish there. In 1966, Bender was nominated by the Missouri Synod as a member of the Music for the Hymns committee of the ILCW. This Commission ultimately produced the Lutheran Book of Worship, which was first published in 1978 (though the Missouri Synod backed out at the eleventh hour!). In his date book, Bender listed these committee meetings as "Gesangbuchbastelst�ndchen" (which means something like �little hymnal crafting hours'). As part of his ongoing participation in these meetings, Bender wrote 110 hymn settings (including accompaniments and choral settings) many of which were subsequently used in these two hymnals and in other collections. He was particularly proud to have been a part of this work and clearly contributed a great deal to the final musical shape of these hymnals. 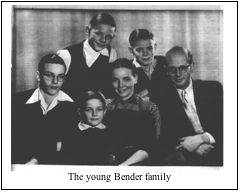 On December 23, 1994, Jan Bender was taken to the hospital in Itzehoe, having apparently suffered a mild stroke. He remained there until December 29, fading in and out of consciousness, when his family took him home. He relaxed into his familiar surroundings, but about three hours later he slipped peacefully into the sleep for which he had longed. Burial was in the Hanerauer Waldfriedhof (the Mannhardt family cemetery established by Charlotte's ancestors), located in the woods just behind the Benders' house. Pall bearers included sons Friedeman and Matthias, grandson Aron, nephews Christiaan Bender, Jan Detleff Peters, and Hinrich Hansen, and friend David Fienen. He was survived by his wife of 55 years, Charlotte (who passed away on March 2, 2002), four sons, Jan Eilhardt, now living in retirement in Hanerau, Friedemann in Kauai, HI, Christoph in Greensboro, NC, and Matthias in Berlin, Germany, nine grandchildren, and one great-grandson. The inscription on his gravestone, designed by his son, Friedemann, uses Bender's own handwriting from his diaries. During his career, Bender received many awards, including the Canticum Novum Award from Wittenberg University in May 1975, an honorary Doctor of Letters degree from Concordia Teachers College, Seward, NE, also in May 1975, and the Gustavus Fine Arts Award from Gustavus Adolphus College in May 1979. In 1987, the Association of Lutheran Church Musicians named him the first Honorary Life Member. He was also named an Honorary Fellow of the Hymn Society of America. One of the more intriguing honors bestowed on Professor Bender was his inclusion in a large church window at Holy Cross Lutheran Church, Detroit, MI. 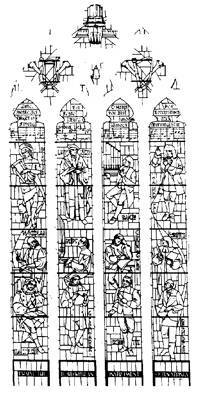 This window, dedicated to church musicians, includes Luther, David, Bach, Handel, Watts, Sch�tz, Nicolai, and Jan Bender (the only 20th century figure in the group). 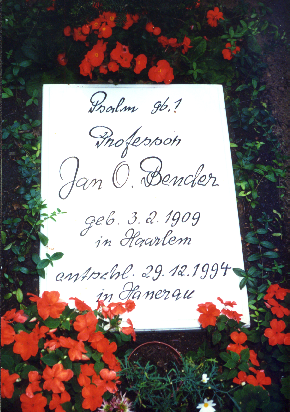 Jan Bender made many significant contributions to church music both in Germany and in America. During his long career, he wrote about 2,500 compositions, including 444 choral pieces, 816 for organ, 54 for brass, 26 for instrumental ensembles, 932 for keyboard (piano and/or harpsichord—this number includes individual piano settings for every hymn in the Lutheran Book of Worship, opus 75b), 102 songs, 83 handbell pieces, and one textbook (opus 59). Some of these compositions are still in the catalogs of publishers on both sides of the Atlantic. He has influenced many current church musicians and teachers by his example and, more directly, as their organ or composition teacher. He was a very warm, caring, Christian gentleman, who had strong convictions in his concern for high standards both of musical choice and execution in the worship of God. About church music, Jan wrote in 1967: "Church music should have its roots in the past but at the same time should show that as an art it is developing and growing and able to change from something old to something new." (Church Music 67.2, p. 9) As to his personal goals as a composer of church music, he said in the same article: "I am trying to show that church music is something alive and wonderful, that is capable of being used as a means of expression of our faith, confession, love and joy and gratefulness to God." (ibid., p. 14) Bender considered his music to be a bridge between the very advanced music of today and the sensibilities of the Christian layperson. His goal throughout his career was to maintain a high level of creativity and craft in his composing while still communicating with the person in the pew. "Herr, nun l�ssest du deinen Diener im Frieden fahren..."
"Lord, Now lettest Thou Thy servant depart in peace... "